Back in high school, the PPCC was taught that the old "melting pot" aphorism of American culture was considered passé, insensitive even, since it implied a homogenization of the diversity of immigrant cultures. Instead, we were supposed to say America is like a "tossed salad" - everyone jumping around together, joyous, distinct, fresh and crispy. 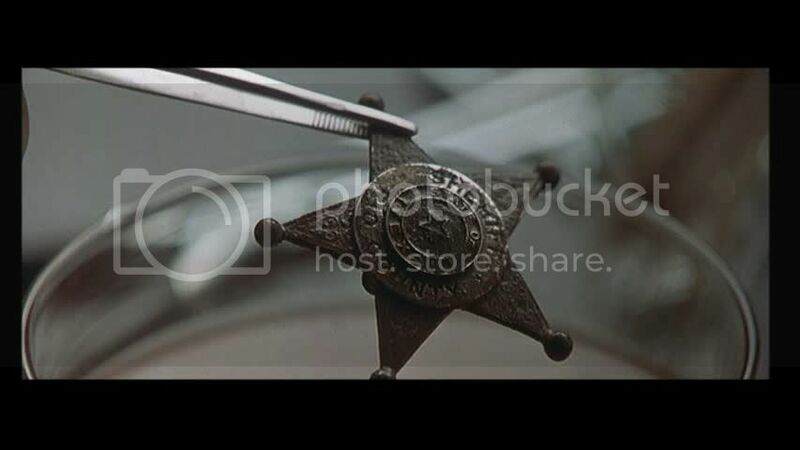 John Sayles' ballad about Texas, Lone Star, brings the "melting pot" idea back - and with a vengeance. A story about a Tex-Mex border town on the Rio Grande, it is all about intermingling - of the past and the present, of cultures and ethnicities, of legend and fact. Ultimately, the movie concludes that we're all a big family. But don't begin vomiting at the sight of such a Disney-style simplification: when Sayles says family, he means FAMILY. Angst-ridden, constantly clashing, unwillingly linked and reluctantly dependent on each other. The kind of family that stresses you out at the holidays. Not the kind of family that seems like a good idea when you're living alone in your apartment, independent of them and stress-free. Ah ha! I have found a single star in a state of the lone star! A visual triangle. The inner film nerd approves. Rio County Sheriff Sam Deeds (Chris Cooper) sighs and snorts his way through sheriff life - he is tired of the realpolitik surrounding his job ("I'm a jailer," Sam laments. "I run a sixty-room hotel with bars on the windows. "), he is tired of living forever in the shadow of his legendary father and previous sheriff, Buddy Deeds (Matthew McConaughey, in flashbacks), and he is tired of pining for his high school sweetheart, schoolteacher Pilar (Elizabeth Peña). 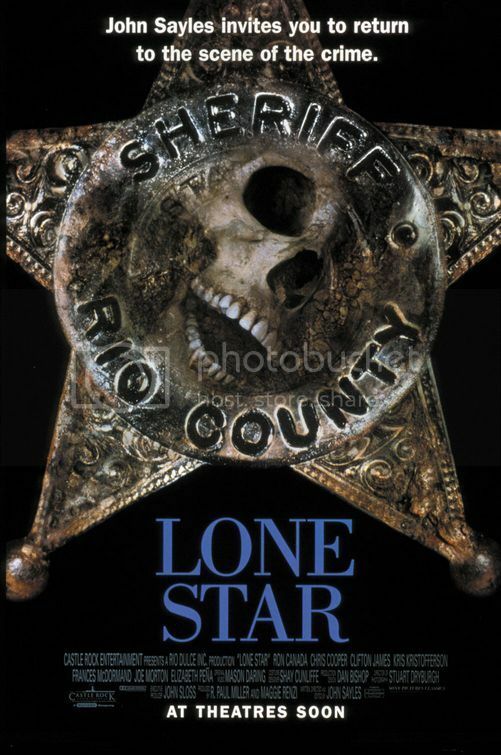 One day, when two of the local army guys (an excellent Stephen Mendillo, Stephen J. Lang) uncover a human skeleton and charred sheriff's star (a… LONE STAR, GET IT!) in the desert by their base, Sam is called in to figure things out. And he, and everyone else, just assumes it was the deed (!) 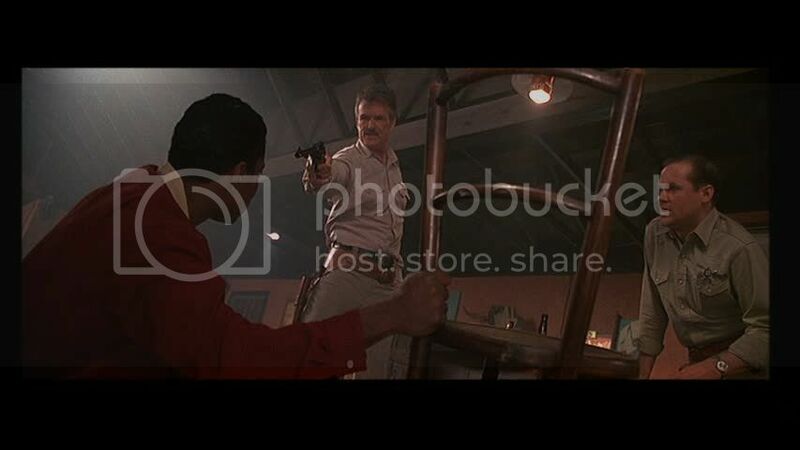 of Buddy Deeds finally taking vengeance on the evil sheriff of yore, Charlie Wade (a vile Kris Kristofferson). Sam's investigation into this 40-year-old murder pulls in all the tangled history (and tangled present, for that matter) of the town - particularly the race and power relations between the African-Americans, Mexicans (and Mexican-Americans), "Anglos" and Native Americans. To this end, there are some great subplots which run tangential to the Deeds crime investigation - such as the Payne family, which have not one but two pairs of tense father-son battles: that between bar owner Otis (Ron Canada) and his military son Delmore (Joe Morton), and that between Delmore and his resentful teenage son Chet (Eddie Robinson). The Payne scenes manage to talk about militarism, estrangement and disappointment, and changing race relations. Then there is the Cruz family, with matriarch Mercedes (Miriam Colon), who runs a Mexican restaurant, insisting that everyone speak English ("Speak English! This is the United States!") and promptly calling border patrol every time she spots illegal immigrants sneaking through her property (she lives next to the river), and her daughter, the very same Pilar for whom Sam yearns. Overall, it's a rich tapestry - a soup, even! definitely not a salad - with a variety of perspectives and emotional tones. The final, very American message of tabula rasa (which could be another way of saying cutting ties or turning away from heritage when it gets too complicated...) is delivered effectively and uniquely. As Otis comments, "Blood only means what you let it." Yeehaw! Oh, how I love this movie. I may watch it again today! It's the kind of movie I generally don't like: multi-generational family drama about issues. But the characters are so interesting, the acting is great -- and I wish Chris Cooper and Elizabeth Pena got more roles as good as these!